Happy New Year! If you’ve included travel, adventure, and experiences among your resolutions, you’re in the right place. We’re honored to present to you a bucket list for Virginia’s Blue Ridge. Our bucket list is loaded with “cream of the crop” must-sees, dos, and savors for an indisputable, quintessential Virginia’s Blue Ridge escape. Check off as many as you can in one trip or spread these experiences across multiple VBR getaways in 2018. We promise you will love every second in these mountains. Cheers! At the top of any list that involves Virginia’s best experiences is the Blue Ridge Parkway, America’s Favorite Drive. It’s a slow pace with incredible views and opportunities to hike, dine, and stay the night. Travel just a segment, all of Virginia, or the BRP in its entirety. Any stretch of this road is memorable. You’ll feel like you deserve a crown of your own after you hike Virginia’s Triple Crown. These three peaks – Dragon’s Tooth, McAfee Knob, and Tinker Cliffs (pictured above) – create a 32-mile loop trail and include shelters along the way for an overnight. The Norfolk & Western Class A 1218 steam locomotive is a big draw for train enthusiasts as it’s one of the most advanced steam locomotives ever built and was the one-time strongest pulling locomotives in existence. It’s the last 2-6-6-4 steam locomotive in the world and the last Class A. 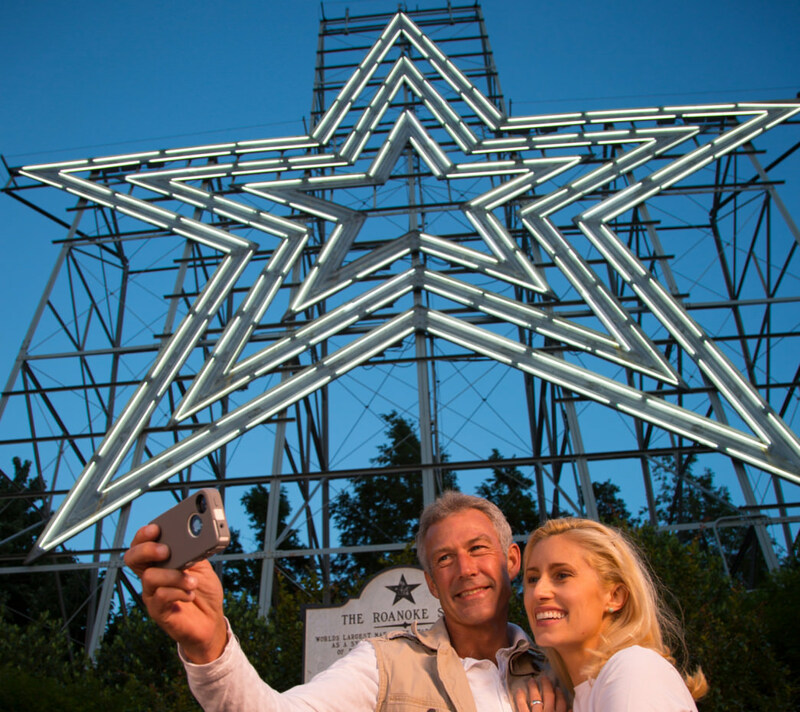 The largest neon star of its kind in the world, a visit to the Roanoke Star is nearly mandatory for anyone spending time in Roanoke. From its perch you can see for miles and miles, but it’s the lights of downtown Roanoke that steal the show and mesmerize those who take them in. If you’re like me and get hung up on a favorite TV show, you might have a strong desire to visit a location associated with it. Your wish is granted in Virginia’s Blue Ridge, as DIY’s Salvage Dawgs is filmed in Roanoke at Black Dog Salvage. Come meet the stars of the show and peruse their warehouse to find the perfect upcycle, repurpose, or found piece to make your own. “The wettest county in the world” is in Virginia’s Blue Ridge. Come wet your whistle with legal moonshine distilled and bottled in Franklin County, Virginia at Twin Creeks Distillery. Our favorite hole-in-the-wall is true vintage, nostalgic, and so, so good. The tiny 10-seat Texas Tavern is open 24/7 and serves up some of our favorite cravings, including a Cheesy Western, a hamburger patty topped with a fried egg, homemade relish, cheese, pickles, and onions. Swinging bridges are few and far between these days, but we happen to know of one that is still prominently front and center, begging for brave souls to stroll across its wooden planks. The James River Swinging Bridge in Buchanan just about parallels Route 11 and offers an excellent vantage point from which to watch tubers and boaters shove off the bank from Twin River Outfitters. To the community who lost the most soldiers per capita on June 6, 1944, aka D-Day, a nine-acre memorial was given. 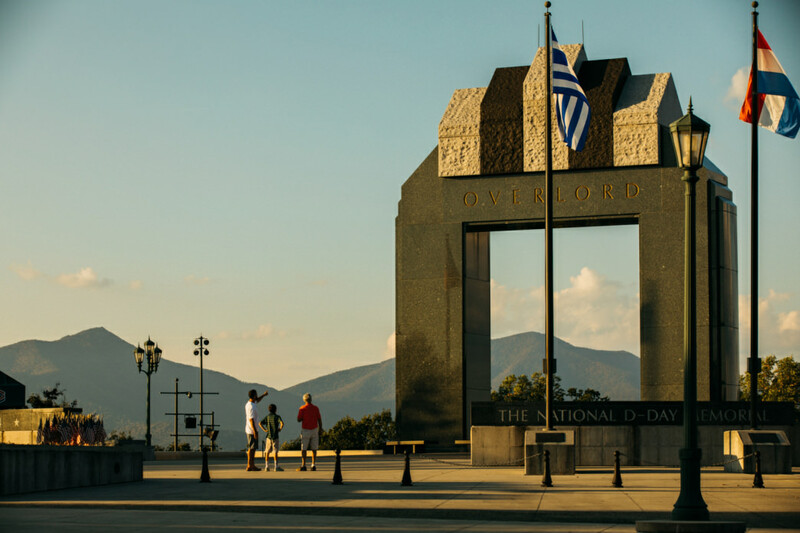 That community was Bedford, Virginia, and a visit to the National D-Day Memorial is one you will never forget. When you adventure to taste the local goodness, craft beer shouldn’t be overlooked. There are numerous breweries to taste on Virginia’s Blue Ridge Beerway, but three we recommend right off the bat are Parkway Brewing Company in Salem, Deschutes Brewery in Roanoke, and Ballast Point Brewing Company in Daleville. Be sure to designate a driver. In 2017 the Travel Channel named the James River as one of the 21 best lazy rivers to float in summer. Who are we to argue with the Travel Channel? The appeal to floating the James is that 59 miles of the Upper James River Water Trail is designated as a Virginia Scenic River. Our outfitters have the gear, so just suit up and show up for a lazy day of summer fun. Ten galleries featuring a variety of art welcome guests for free at the Taubman Museum of Art in downtown Roanoke. Even children will love a stop here, as they’re welcome to get their hands busy at Art Venture, an exploratory space for ages 2 to 12. Our favorite glistening body of water for a sunset boat ride is Smith Mountain Lake. With 500 miles of shoreline, the lake takes up 32 square miles of area and averages 55 feet in depth. Oh, and three counties claim a chunk of it. You’re going to want to ride, swim, wake board, and fish your heart out. Spend the better portion of the day exploring a variety of museums all under one roof. Center in the Square is one of the coolest destinations in Virginia’s Blue Ridge for that reason alone. Where else can you explore African American history, play vintage pinball to your heart’s content, observe a day in the life of the mid-Atlantic’s largest coral reef aquarium, and turn your kids loose into a children’s museum? Nowhere. And that’s not even all of it. Not every farmers market is the same. Sure, most (if not all) have farm-fresh yields of produce and maybe meat, eggs, and honey, but the artisans are never the same. Be sure to visit one of ours in whichever community you happen to be in to further explore some of the best flavors and careful craftsmanship our area has to offer. There are many things to do on a Friday night in Virginia’s Blue Ridge, but for bucket list purposes, there’s no other place to be than the Floyd Country Store for the Friday Night Jamboree. You don’t have to pick, sing, or dance, but you can if you want to. We’re all family in Floyd. Continuing the quest for savory flavors, local wineries are an excellent treat for your palate and great opportunities to unwind. We love the wineries of the Wine Trail of Botetourt County and the beautiful grounds, food, and wine of Chateau Morrisette in Floyd. Most Americans known Metallica’s “Enter Sandman,” but have most Americans experienced Lane Stadium while “Enter Sandman” plays loud over the speakers as fans jump up and down and the Virginia Tech Hokies take the field? No. Those few minutes of music, yelling and jumping have registered on a seismograph four times. That is, Metallica and the Hokie faithful occasionally cause earthquakes in Blacksburg. A 19th century iron ore is on the National Register of Historic Places, and you’ll pass it as you make your way along Roaring Run Trail to seek out Roaring Run Falls in Eagle Rock. The trail winds back and forth across the run, which tends to be mostly shallow and excellent for family adventure. The Natural Bridge is one of those geologic wonders you have to see to believe. As you approach it at Natural Bridge State Park, you’re immediately amazed (trust me), but when you stand below it and look up 215 feet, you’re left nearly breathless. Take your time looking it over; you’ll find a few surprises with a keen eye. An intimate venue that seats no more than 475 people (700 standing), The Harvester is a premier concert venue in Virginia’s Blue Ridge. It’s not unusual to catch up-and-coming artists or solid gold mainstays still working the circuit for dedicated fans. Farm-fresh homemade ice cream is a treasure and we know where to find it. Take the beautiful drive to Burnt Chimney for hormone- and antibiotic-free sweet treats in 18 delightful flavors. One of the nation’s premier mountain biking destinations is Carvins Cove, boasting 60 miles of singletrack, trails, and fire roads on more than 12,500 acres. The glistening gem that makes this Natural Reserve a draw for more than those on two wheels is the 630-acre reservoir. You have much to see and much to do. It reminds us of “Oh, the Places You’ll Go” by Dr. Seuss. Happy trails and be sure to document your #BlueRidgeDay!